UNITED STATES– The Kyadondo East Legislator, Hon. Robert Kyagulanyi Sentamu alias Bobi Wine on Wednesday met Rev. Jesse L. Jackson Sr, the towering leader of the civil rights movement in the United States. 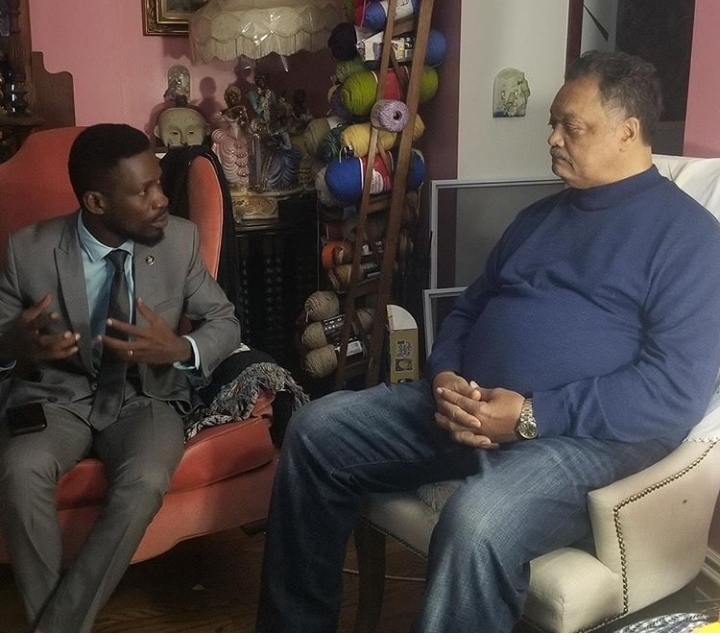 According to a social media post, Bobi Wine said while in a meeting with Jackson, the dual discussed how to fight for freedom and prayed for Uganda and the African continent at large. Hon. Kyagulanyi added that it was such a pleasure to hold a discussion with such an important person in the World. “It was humbling and uplifting to pray with him for our country Uganda and the continent of Africa such a historic encounter we shall certainly overcome”, Bobi Wine tweeted. The dual also went ahead to share ideas on how to overcome injustices in the World. The lawmaker Hon. Kyagulanyi shared with him on how ‘he and his people power’ pressure group overcome and shun violence in Uganda. “The people we are up against draw inspiration from violent movements which is why they resort to violence at every opportunity. As people power, we draw inspiration and counsel from non-violent movements which why we despise and shun violence even when provoked,” he said. The legislator informed Reverend Jesse that he is one of the inspirations to Ugandan leaders that’s why they use his tactics to fight for freedom in the country. Rev.Jackson worked very closely with Dr. Martin Luther King Junior in the fight against injustice, poverty, and discrimination.